CFOs have an opportunity to become even more valuable to their organizations. Delivering the data and advanced analytics for business intelligence and management information will be a critical capability for tomorrow’s finance function, according 57% of group CFOs from EY and Forbes Insights’ survey of 564 executives in large global enterprises. However, many organizations are still struggling to turn the promise of data analytics into the reality of improved performance. Furthermore, most admit they still do not have an effective strategy for competing in a digital world and struggle with getting business users to adopt analytics insights. Around two thirds of ‘adoption leaders’ (the top 10% of all enterprises) rate this change management as an “extremely important” component of their data and analytics engagements – but only about one-third of the broader cross-section of respondents see it this way. Data science moves us from the accounting role of reporting the past to the finance role of guiding the future. I think that’s one of the most exciting things I’ve seen happen in finance in many years. The use of analytics is increasing – so what’s missing? 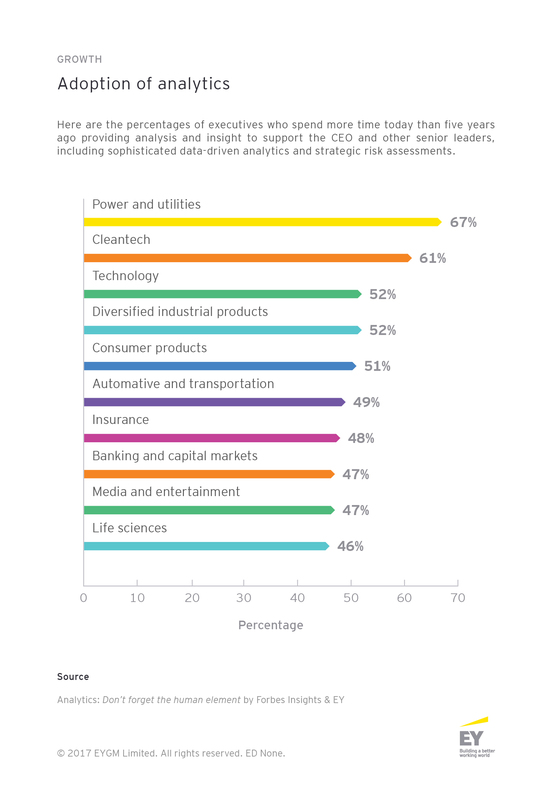 In the past five years, 50% of CFOs in our survey have increased the amount of time they dedicate to using advanced analytics to provide insight to the CEO and other senior leaders, though this varies by sector. As CFOs become more focused on deriving strategic insight from data, they increasingly see the need for investment in the right people, as well as the right technology. Over the past few years, many organizations have spent millions of dollars on technology to mine and manage data, but achieved disappointing returns. This is often because they spend relatively little on drawing actionable insights out of the data and convincing people to use them. That calls for an analytics strategy that places human insight at its core, rather than technology. In order to realize the potential of data and analytics for their organization, CFOs will need to focus increasingly on this crucial — and complicated — area. To translate this human-driven strategy into a long-term competitive advantage, CFOs will need to assess the potential disruption for the organization as a whole, and define the role that they and their finance function should play. In some cases, this will mean providing input into finance-specific projects and workstreams, in others it may mean leading an enterprise-wide analytics capability – such as forecasting customer behavior through data to better estimate future revenues. 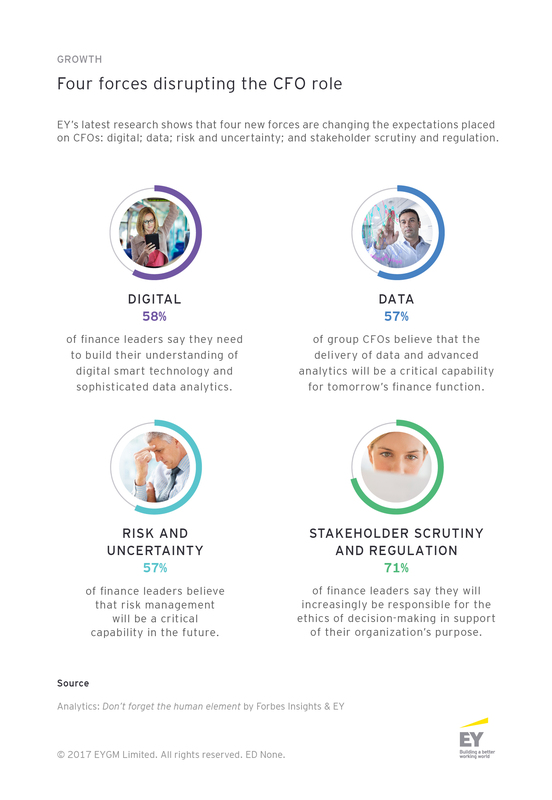 As a role that already spans across organizational silos, the CFO now has the opportunity to broaden out the use of analytics from the traditional finance functions of budgeting and forecasting – to the operational needs of the wider business. Viewing data from the perspective of a money- and data-conscious CFO should enable organizations to act on the insights and opportunities revealed by analytics as they occur – before it is too late. 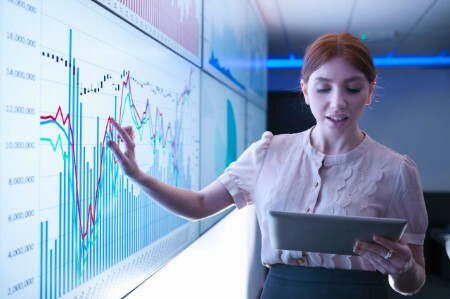 CFOs are well-placed to make the case for deploying data analytics across the organization, adding a new strategic edge to the finance function.